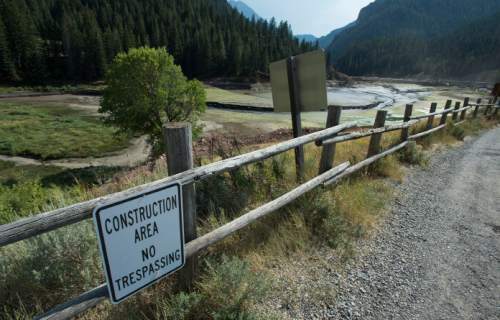 Sediment washed down from Tibble Fork could devastate popular trout fishery. 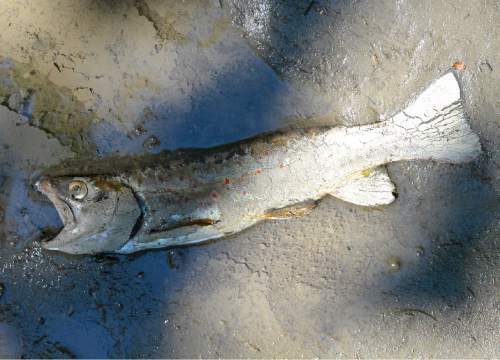 Courtesy | Brian Wimmer Dead fish along the American Fork River, which has been filled with silt from drainage of Tibble Fork Reservoir. Courtesy | Brian Wimmer A dead trout along the American Fork River, which has been filled with silt from drainage of Tibble Fork Reservoir. 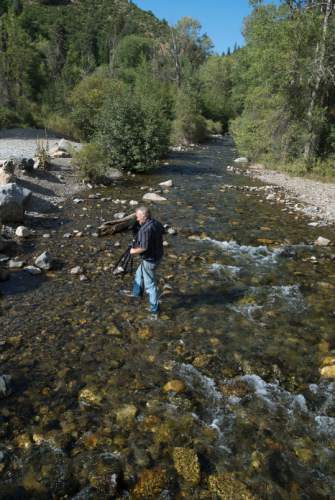 Steve Griffin / The Salt Lake Tribune Mark Allen, of the American Fork Canyon Alliance, shoots video of the American Fork River as it runs black with silt in American Fork Canyon in American Fork, Utah Monday August 22, 2016. The river picked up the silt after running through the drained Tibble Fork Reservoir. The reservoir has been emptied because of the Tibble Fork Dam Rehabilitation Project. Steve Griffin / The Salt Lake Tribune The drained Tibble Fork Reservoir in American Fork Canyon Monday August 22, 2016. The reservoir has been emptied because of the Tibble Fork Dam Rehabilitation Project. Steve Griffin / The Salt Lake Tribune Mark Allen, of the American Fork Canyon Alliance, shoots video of the American Fork River as it runs into Tibble Fork Reservoir in American Fork Canyon Monday August 22, 2016. 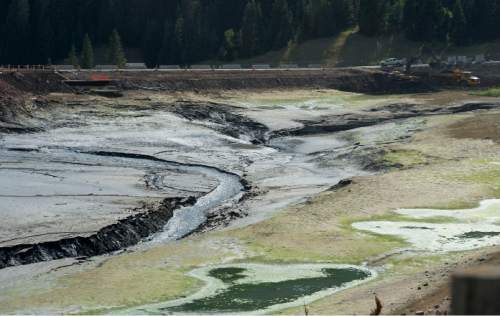 The river, which runs through the drained Tibble Fork Reservoir, was running black with silt after passing through Tibble Fork Dam Rehabilitation Project. Steve Griffin / The Salt Lake Tribune The drained Tibble Fork Reservoir in American Fork Canyon Monday August 22, 2016. The reservoir has been emptied because of the Tibble Fork Dam Rehabilitation Project. Steve Griffin / The Salt Lake Tribune The drained Tibble Fork Reservoir in American Fork Canyon Monday August 22, 2016. The reservoir has been emptied because of the Tibble Fork Dam Rehabilitation Project. The American Fork River was running black with silt as it flowed through the project. Courtesy | Brian Wimmer A dead trout along the American Fork River, which has been filled with silt from drainage of Tibble Fork Reservoir. Steve Griffin / The Salt Lake Tribune The American Fork River runs black with silt in American Fork Canyon in American Fork, Utah Monday August 22, 2016. The river picked up the silt after running through the drained Tibble Fork Reservoir. The reservoir has been emptied because of the Tibble Fork Dam Rehabilitation Project. 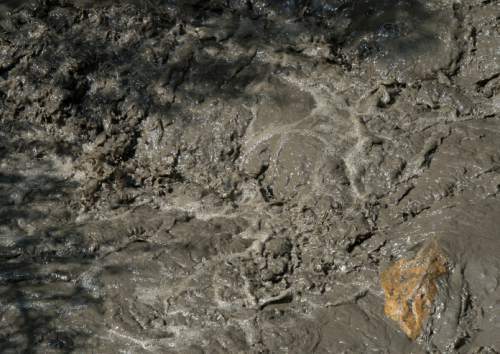 The creek running down American Fork Canyon has become clogged with muck after an upstream reservoir was drained as part of dam rehabilitation project. 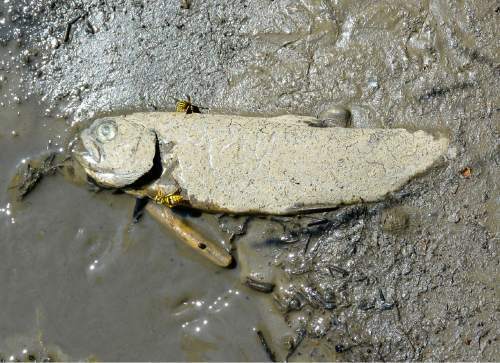 The fine-grained sediments turned water black below Tibble Fork Dam, leaving a trail of dead trout and potentially degrading habitat for all sorts of aquatic life, according to observers. "It would be a surprise if anything could live through this. It is suffocating the fish it is so thick," said Brian Wimmer, president of a Utah County chapter of Trout Unlimited. "There is 4 inches of this disgusting mud 3 feet above the high water mark. It will take a major flush to bring the life back to this river." Wimmer and colleague Grant Bench spent Monday afternoon in the canyon and observed dead fish as far downstream as Swinging Bridge, near the mouth of the canyon. They encountered places in Tibble Fork with sediments up to 2 feet deep in places where normally water runs clear to a depth of 3 feet. 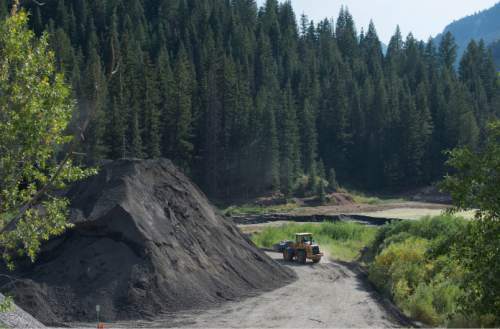 The incident could wind up dealing a ecological blow to American Fork Canyon, a popular recreation destination, especially among anglers, in the Uinta-Wasatch-Cache National Forest east of Pleasant Grove. On Monday, officials were scrambling for answers and the project contractor agreed to cease releases from the dam. Biologists from the Utah Division of Wildlife Resources (DWR) and the U.S. Forest Service examined the creek and muddy remains of the drained Tibble Fork Reservoir. They will return Tuesday with electroshocking equipment to determine whether fish have survived downstream, according to DWR fisheries biologist Mike Slater. The stream was so murky Monday that it was not possible to detect any fish activity, although plenty of living macro-invertebrates could be found under rocks. 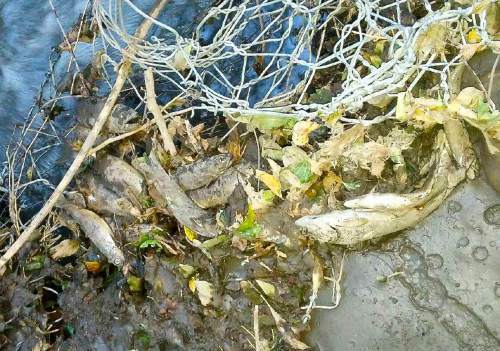 "The majority of the dead fish are coming from the reservoir. They are getting pushed down the system," Slater said. "We haven&apos;t suffocated everything downstream. Fish end up being more resilient than we give them credit for. That&apos;s my hope here." Earlier this summer, the federal Natural Resources Conservation Service (NRCS) commenced a $7.3 million project to rehabilitate the 50-year-old dam. The goal is to strengthen the earthen structure dam, which is at risk of failure, and raise the reservoir by 9 feet. DWR normally stocks Tibble Fork with 14,000 rainbow trout each year, but this year the reservoir will be closed to fishing and other uses while dam reconstruction is completed. The reservoir stores irrigation water for the North Utah County Water Conservancy District. Over the years, sediment piling up behind the dam has reduced the 10-acre reservoir&apos;s capacity by more than 50 acre-feet, indicating that the lakebed is buried to an average depth of 5 feet. This weekend, crews began draining the reservoir and NRCS posted a notice that elevated levels of sediment would be apparent downstream to Timpanogos Cave National Monument. "Best management practices are installed as much as practical to help minimize sediment transport in the stream flow below the dam," the notice said. "All discharges are in accordance with the environmental analysis, permits and laws." An agency spokesman could not be reach for comment Monday. Slater believes the draining discharged far more sediment than NRCS anticipated. Once the reservoir emptied, the stream carved a path through sediment accumulated in the lakebed and pushed the material down the canyon through the river channel, he said. The dam-project contractor closed the gate in an effort to build water back up in the reservoir with the idea of releasing the water in pulses. "They are doing everything they can to minimize the sediments. The fish can handle it in pulses," Slater said.